What's Next for the #Edcamp Movement? In 2010, veteran educator Hadley Ferguson was one of 10 teachers who organized the first-ever Edcamp. Edcamp Philly demonstrated the power of teachers coming together for their own peer-to-peer professional development. The buzz that the one-day event generated, in person and on social media, quickly sparked a movement. They're free, non-commercial, and participant-driven. By now, some 50,000 teachers have taken part in 750 Edcamps in at least 25 countries. To engage even more teachers in this powerful unconference learning model, the Bill & Melinda Gates Foundation recently awarded a $2 million grant to the Edcamp Foundation. 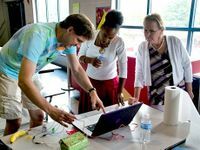 Ferguson, who left the classroom to become the first executive director of the Edcamp Foundation, offers a glimpse of what's ahead. Edutopia: Edcamps have always been about educators running their own show. Each event is locally organized, and the people who show up decide what they want to talk about. Given the success of this grassroots approach, why the need for an organization? Hadley Ferguson: As Edcamps began to take off, companies and individuals started asking how they could donate or support this movement. Two years ago, we formed a nonprofit organization. Funding from the NewSchools Seed Fund enabled us to set up the Edcamp Foundation and hire an executive director. Our goal is to support the continuation and growth of this movement. We know that for every Edcamp -- and there were 255 last year that we know about -- there are probably five or 10 local organizers. They're all volunteers with full-time jobs. We want to honor and support their work and offer resources to make it easier for volunteers to host these events. The foundation is there to say, "Let us help make this as easy as possible." Edutopia: What does that help look like? Hadley Ferguson: Anyone who wants to host an event can ask for help. We have an online toolkit. Then there's Edcamp-in-a-box, which contains materials like Post-it notes, name tags, stickers, and even some swag from sponsors. When that box arrives, organizers are reminded that they're not in this alone. Edutopia: What are the hot trends in session topics? Hadley Ferguson: Each event focuses on what the people who show up want to talk about. That might be the maker movement, digital literacy, cyber security, or what to do with the ADHD kid in your class. There are themes, but it all comes down to what the participants decide. Edutopia: Do participants need to be experts in these topics to lead sessions? Hadley Ferguson: Some of the best sessions are based around a question rather than a facilitator's expertise. It's different than going to a conference like ISTE where presenters have their slide decks, handouts, and talking points. Edcamp is about the conversation. Collaboration brings about the expertise. For some participants, this might be their first step into being a teacher leader. And it all starts by asking a question and explaining why that question matters to you. It's a way of professional learning that is about participants engaging rather than sitting in rows and listening. Edutopia: Sounds like a description of a student-centered classroom. Hadley Ferguson: We educators do our best when we are learners, too. If you ever stop learning and growing, you can forget how hard that is to do. Edcamps validate that it's OK to have questions. It's OK to want to learn more. And it's OK to be doing that together. 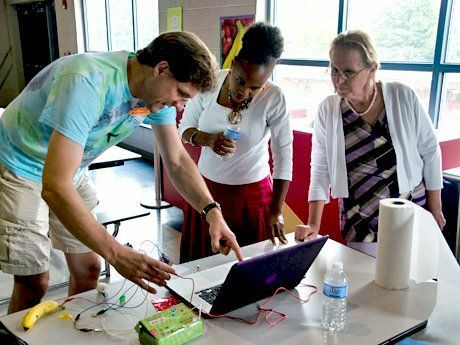 Edutopia: With Edcamps appealing to teachers from diverse contexts, there must be some interesting cross-pollination of ideas. Hadley Ferguson: You might have people who have been in the classroom for six months or for 25 years. They're coming from public schools, charters, independent and parochial schools. Then when you bring in students, which is happening more and more, that adds even more information about the topic. Who doesn't want to know what students think? Edutopia: What will the Gates grant allow the Edcamp Foundation to do next? Hadley Ferguson: Carina Wong of the Gates Foundation encouraged us to dream big. How could we give teachers more voice and opportunities to collaborate as a step in developing teacher leadership? How could we help the Edcamp magic last beyond the one day of the event? How can we spread the impact of the new learning that a teacher can have? Three programs came out of those conversations. One is Edcamp-in-a-Box, which the grant now funds. We're planning summits for organizers from different regions so they can discuss best practices and grow their network. We're also launching a teacher grant program. If you hear about an idea at an Edcamp that you want to bring to life in your classroom, you'll be able to apply for $1,000 in funding to make it happen. We expect the summits and teacher grants to launch in 2016. Edutopia: Any advice to newcomers to the Edcamp movement? Hadley Ferguson: For those who want to start a new event, keep in mind that it's simpler than it may look. It's about providing space for teachers to have conversations. That doesn't have to be fancy. And for those who are attending their first Edcamp, remember that everybody's there to make connections. There's no in-crowd. Nobody knows everything. It's about all of us coming together so we can create something far better.